Black carbon is a potent climate-warming component of particulate matter formed by the incomplete combustion of fossil fuels, wood and other fuels. Complete combustion would turn all carbon in the fuel into carbon dioxide (CO2), but combustion is never complete and CO2, carbon monoxide, volatile organic compounds, and organic carbon and black carbon particles are all formed in the process. 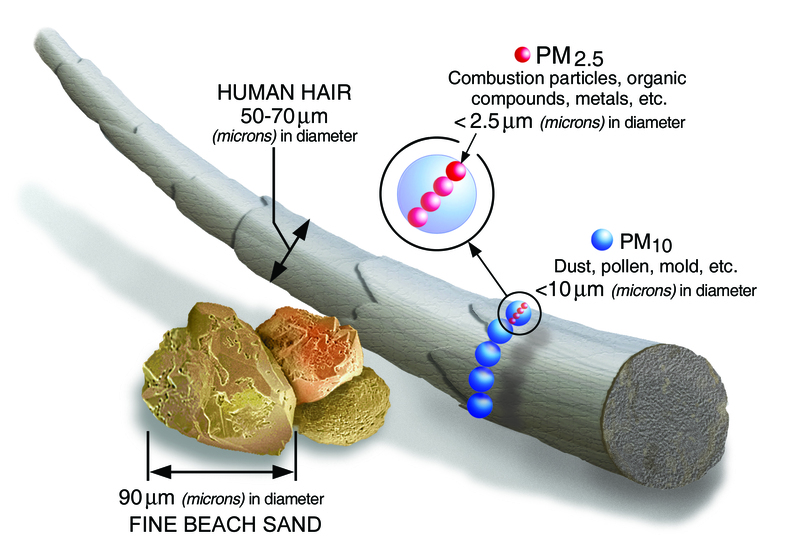 The complex mixture of particulate matter resulting from incomplete combustion is often referred to as soot. Black carbon is a short-lived climate pollutant with a lifetime of only days to weeks after release in the atmosphere. During this short period of time, black carbon can have significant direct and indirect impacts on the climate, glacial regions, agriculture and human health. Several studies have demonstrated that measures to prevent black carbon emissions can reduce near-term warming of the climate, increase crop yields and prevent premature deaths. Black carbon emissions have been decreasing over the past decades in many developed countries due to stricter air quality regulations. By contrast, emissions are increasing rapidly in many developing countries where air quality is not regulated. 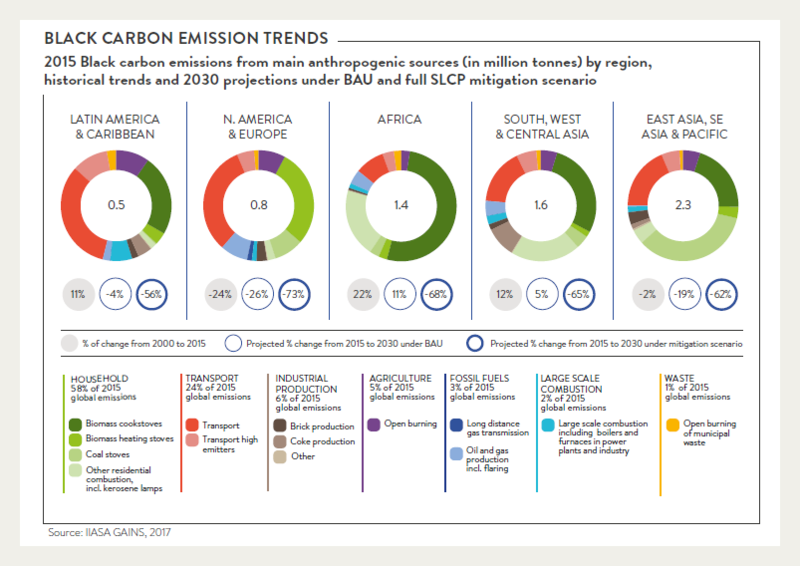 As the result of open biomass burning and residential solid fuel combustion, Asia, Africa and Latin America contribute approximately 88% of global black carbon emissions. Black carbon is always co-emitted with other particles and gases, some of which have a cooling effect on the climate. The type and quantity of co-pollutants differs according to the source. Sources that release a high ratio of warming to cooling pollutants represent the most promising targets for mitigation and achieving climate and health benefits in the near term. Black carbon is an important contributor to warming because it is very effective at absorbing light and heating its surroundings. Per unit of mass, black carbon has a warming impact on climate that is 460-1,500 times stronger than CO2. When suspended in the atmosphere, black carbon contributes to warming by converting incoming solar radiation to heat. It also influences cloud formation and impacts regional circulation and rainfall patterns. When deposited on ice and snow, black carbon and co-emitted particles reduce surface albedo (the ability to reflect sunlight) and heat the surface. 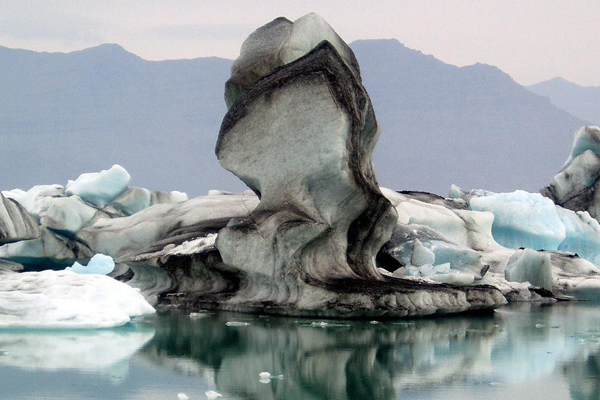 The Arctic and glaciated regions such as the Himalayas are particularly vulnerable to melting as a result. Black carbon and its co-pollutants are key components of fine particulate matter (PM2.5) air pollution, the leading environmental cause of poor health and premature deaths. At 2.5 micrometres or smaller in diameter, these particles are, many times smaller than a grain of table salt, which allows them to penetrate into the deepest regions of the lungs and facilitate the transport of toxic compounds into the bloodstream. PM2.5 has been linked to a number of health impacts including premature death in adults with heart and lung disease, strokes, heart attacks, chronic respiratory disease such as bronchitis, aggravated asthma and other cardio-respiratory symptoms. It is also responsible for premature deaths of children from acute lower respiratory infections such as pneumonia. Each year, an estimated 7 million premature deaths are attributed to household and ambient (outdoor) PM2.5 air pollution. Black carbon can affect the health of ecosystems in several ways: by depositing on plant leaves and increasing their temperature, dimming sunlight that reaches the earth, and modifying rainfall patterns. Changing rain patterns can have far-reaching consequences for both ecosystems and human livelihoods, for example by disrupting monsoons, which are critical for agriculture in large parts of Asia and Africa. Black carbon’s short atmospheric lifetime, combined with its strong warming potential, means that targeted strategies to reduce emissions can provide climate and health benefits within a relatively short period of time. The Coalition supports implementation of control measures that, if globally implemented by 2030, could reduce global black carbon emissions by as much as 80% (UNEP & WMO 2011). Several of these emission reductions could be achieved with net cost savings. Adopting these measures would have major positive co-benefits for public health, especially in the developing world.